If you have been using Google Drive on your computer or as a cloud storage solution, it is a great idea to download the mobile application to enable access to your files regardless of where you go. To use Google Drive on your smartphone or tablet, you must first download the app from the Amazon App Store, Google Play, iOS App Store, or Microsoft Store. Keep in mind the Windows mobile version is a third-party client that connects to your Google account, called Metro Drive. It offers all the same functionality as the original Google Drive mobile app. Unfortunately, if you choose to upload or download more than five files a day, you have to sign up for the service at $3.99 per month. Locate the newly installed Google Drive icon from your app list or home screen and launch the application. Enter your Google account credentials to login. Once logged in, you will be presented with a sidebar. 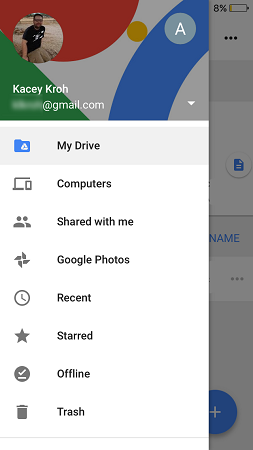 Tap on My Drive to view your Google Drive contents. The sidebar will slide out to the left leaving you with a list of all your Google Drive files and folders. Tap the file you wish to work with. A menu will slide up from the bottom of the screen allowing you to share, work offline, send a copy, edit with connected apps, and print. Tap the correlating icon to make your choice. 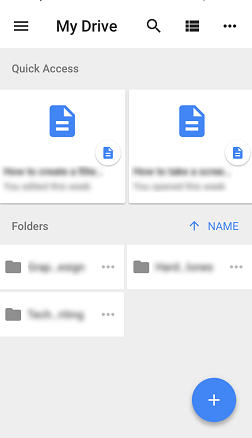 To upload a file to Google Drive simply tap the Add icon (blue plus sign) in the bottom right corner. Tap Upload to upload a new file. Tap Folder to create a new folder. Tap Use Camera to scan documents or upload photos. It is wise to set a passcode for your Google Drive app so that it needs to be unlocked whenever the application is launched. Tap on the three dashes in the top left corner. The sidebar will slide out from the left. Swipe to the bottom and choose Settings→ Passcode to setup a password and securely lock your data.